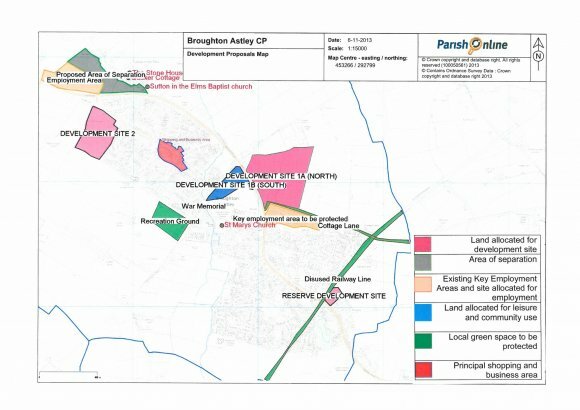 In January 2014 the residents of Broughton Astley voted strongly in support of the adoption of its Neighbourhood Plan. The result of the Neighbourhood Plan Referendum, which took place on 16 January 2014, was announced by the Counting Officer at Harborough District Council. A total number of 2,747 votes were cast; amounting to 38% of residents on the Electoral Register, with 2,451 voting in support of the Neighbourhood Plan – an 89% return. For a Neighbourhood Plan to be formally adopted at least 50% of all those who voted must have supported of the Plan. The adoption of the Plan came at the end of a 2-year development period. The Neighbourhood Plan was only the seventh in the country to be adopted and was one of the first to allocate sites for housing and both retail and commercial provision as well as for a community leisure centre and Medical facility.